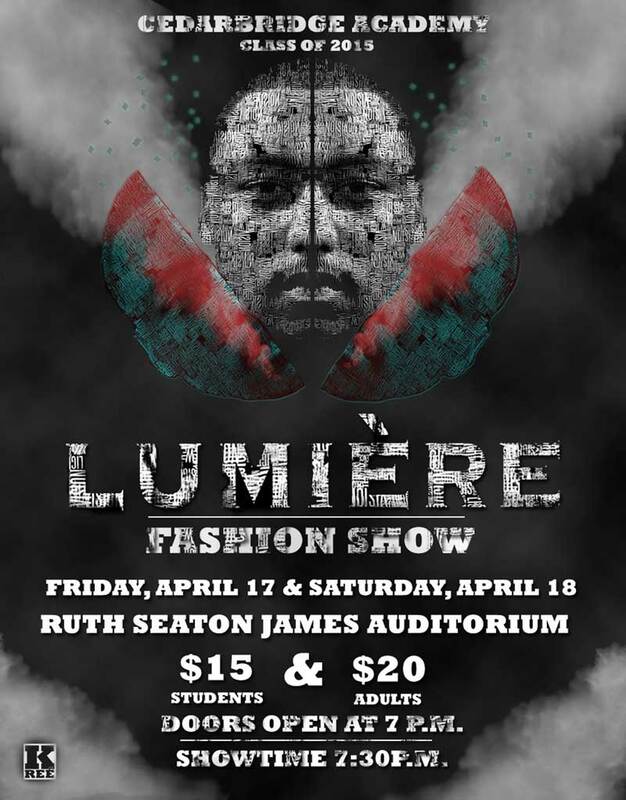 CedarBridge Academy’s class of 2015 is getting set to host its Lumiére Fashion Show on Friday, April 17 and Saturday, April 18 at the Ruth Seaton James Auditorium. The cost of admission will be $15 for students and $20 for adults. Doors will open at 7.00pm each evening, with the show to get underway at 7.30pm. Is Cameron Gordon hosting this one too? I’ve been waiting on this!! This is gonna be off the chain!! Come out and support CBA’s class of 2015!!!! Can’t wait to see! Hope everyone supports. You dont wanna miss it!! This will be a show you don’t want to miss. Not your average fashion show. Everyone come out and support. I’ll definitely be there! CedarBridges students never fail to impress me!! Oh yeah!!! Class of 2015!! Supporting my sons year!! They’re a great bunch of kids! That really get along! Definitely a show to attend!! Heard Cameron is the hosting. Hope its true the guy is a real character !! definitely gone be a great show!!! He had my dying last week Friday ! Cameron. This same boy who hosted the Capital Fashion Show. He was off the chain. Lumière?! Wow what an amazing name, can’t wait to see what they have in store this year! So Nobody is going to mention me? Oh this is going to be hot!! I can not wait to see it. You know I’m coming through on point. Coming to support my girl!! If you thought Capital was good, wait till Friday Im just getting warmed up…. Cant wait for this show, heard they have alot in store. These posters are off the chain! Can’t wait!! Be there this weekend! Friday and Saturday night. Going to be an amazing show! I cant wait to see, these students never fail to impress!! Friday and Saturday Night! Everyone come and support. Show is going to be fire.